Incidentally I co-invented a 14 panel footbag with my partner Reed Gray in 1983 and we named it the Tangent. Those early days were about trying to invent a better footbag than the Hacky Sack which tended not to be round. Out of that early circle of friends came the first multi panel footbag (a footbag with more than two piece construction) the 12 panel Soc Sac (Rick Steinmetz/Reed Gray) and that footbag design opened the door to all new footbag designs that followed. I played professional footbag for 20 years, retiring in 1998 from footbag golf. I had already given up competition in freestyle and net and footbag golf was the last footbag event that I played competitively. I have won more than a few tournaments. As anyone who has played footbag golf knows and for those of you who do not, the golf holes are above ground and have the dimensions of 18” round and 18” high. The holes are cone shaped with a tray at the bottom for roll up puts from outside of a 30 foot putting circle. In my years of playing footbag golf I learned the wisdom of the roll up and would most often position my approach shots to land at about 30 feet so that I could have a “two for one” option of making it into the basket or rolling up into the bottom tray. I worked hard on my 30 foot puts in practice and in my best days I could hit 7 of 10 shots from 30 feet. Most went into the basket but about 25% of them would land in the roll up tray. I also manufacture footbags and on one of my visits overseas for production, my hosts would go regular ball golfing everyday at about 4:00 p.m.. They would play on a private course owned and operated by the local military. It was a 9 hole course. Being left handed and never once playing regular ball golf, I tagged along with my hosts from hole to hole on their round. When they would finish putting and go to the next tee, I would pull out my three putters that I always carried around in my pocket and take a few quick puts before catching up with my friends at the next green. I did this all the way around the course. When we all reached the final hole and as my friends finished their putting, they were greeting by an Army Major who ran the golf course. I saw them pointing at me and lifting their legs as they described to the Major that I played a different kind of golf. They wanted me to demonstrate. Now I knew that I had not made one putt on any of the eight previous holes I putted but I took out my three beauties and focused on the lie. Remember this is not an 18” round, 18” high footbag golf hole. This is a standard ball golf hole. I determined about a one foot break to the left and downhill from my spot at about 30 feet above and to the right of the hole. I lined up my first attempt and it rolled with a perfect break down the hill and into the cup. They all clapped. I line up my second putt and rolled it to a near perfect putt missing off to the right by 6”. Big sigh from the crowd. I line up my third putt and rolled another perfect break right into the cup to a rousing ovation. I do not tell this story often because when I do, it sounds to whacky to be believable. This story is true and is the one thing in footbag golf I remember best of all, even in the face of my last tournament where I made two “holes in one” in 18 holes at the Western Regional Tourney at Stanford University. Rhys Thomas has been performing since the 1970s and Flying Clipper has been in his prop bag since then. Most recently Rhys performed in Abu Dhabi using our new Tossaball Phat Tyre 32 juggle balls. Thanks a bunch Rhys for your support. Plastic pellet filled footbags weigh in at 30 to 45 grams. Sand filled footbags weigh in at 45 to 60 grams. It takes twice as many individual stitches to produce a sand filled footbag verses a plastic pellet filled footbag to keep the sand inside the footbag. All Flying Clipper footbags are hand sewn. It takes approximately 25 minutes per footbag of sewing time to produce one Dirtbag® 8 footbag (a footbag with 8 panels). A Dirtbag® 62 (yep, 62 panels) takes more than two hours to hand sew. Footbags were originally made from cowhide, internally hand-stitched and filled with high density plastic pellets. It was common to have to look through a bin of 100 hacky sacks® to try and find the one that you thought you could break-in. The two piece construction of the original hacky sacks did not lend itself to a round sphere. We used to say that hacky sack® was proof positive that the egg came first! 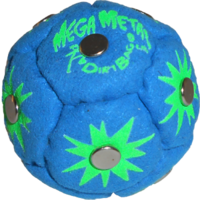 Flying Clipper was among the first to branch out to create new and different designs focusing on roundness, durability and all around footbag play. 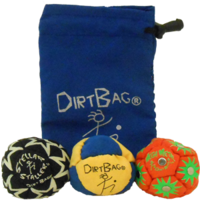 We are the oldest continually operating footbag manufacturer on the planet. While footbagging has always been our passion here at Flying Clipper, the natural extension was to combine feet and hands simultaneously, pushing the envelope as to what can be done using all four extremities to manipulate objects through space. Most footbaggers can juggle (as juggling has been around for thousands of years) while most jugglers do not footbag. The reason is that in the early days, footbags were very firm and not always round which made them hard to kick as a beginner. And as a beginner, juggling was easier to learn. In the beginning footbags were always "kicked" and never "stalled," or stopped on the foot during play. And then Kenny Shults, a long time supporter of Flying Clipper, created delay moves using different sides of his feet. At last the footbag community had its "Michael Jordan." Other kickers picked up and carried on what Kenny Shults did in the pioneering portion of footbag as a sport. You see, until delay moves were created, the bridge between feet and hands could not be advanced. Stalling or delaying the footbag is the same movement done by the hands when juggling. That type of movement has advanced so far that some kickers and jugglers are now seamlessly juggling with combination of feet and hands. 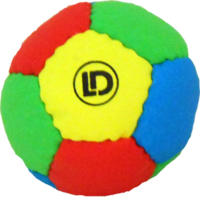 Since its inception in the early 1980's Flying Clipper has also produced its line of juggle balls. Early on as with footbag, all balls were made by the partners, Reed, Dennis and Jim. More than 50,000 juggle balls were produced by the partners over an 18-year span. We know handmade juggling balls inside and out! Recently, with the addition of our Tossaball® line of juggling balls and more recently the Hybrid line of juggle balls, using hand stitch techniques, we created a superior line of beanbags. Many pro jugglers are now coming to our Tossaball® line of juggle balls (aka beanbags). Now Flying Clipper has created a brand new way to make the first truly washable professional quality juggle ball. We call this new method of sewing our "Hybrid" line of juggle balls. Two layers of cover material are hand stitched together but with a twist: we trap heavy crushed rock between the two layers isolating most of the balls weight to the outside rim giving the ball unique qualities unlike any hand made beanbag before. Should I buy a sand filled footbag or a pellet filled footbag? What about a hybrid? 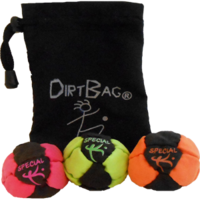 Which Flying clipper footbag do the pros use?